The access controller is the core of the access control system data processing and storage part, is the soul of the access control system. According to the communication between controller and management of computer, divided into RS485 network access controller and TCP / IP network access controller. If a door, go in a door by swipe card, go out by button, the controller for each door can only access a card reader, we call the one-way controller. If a door, go in a door by swipe card, go out also swipe card (you can also take out the door button), each controller for each door can be connected to two readers, one is the door reader, one is out of the card reader, we call Bidirectional controller. Note: Both two-door and single-door controller support two-way, why some four-door controller only supports one-way? The four-doors controller only supports one-way, is out of cost and customer needs to consider. We have counted the needs of customers, if a customer needs to control dozens of doors, generally only a few of them need a two-way card reader, most of the door just need a one-way card reader. Some customers want to connect two readers in parallel with a card reader wiring port. In theory, no way, the two card readers may affect each other and damage the reader and controller, a card reader can not distinguish between the door record or out of the record, swipe a card may have two records, although the test on the desktop is not a big problem, we still recommend that you do not do that, in order to avoid the trouble of equipment damage later. What are the commonly used communication and networking models for access controllers? What’s the difference, advantages, and disadvantages between RS485 network access controller and TCP / IP network access controller? Access controller commonly used communication methods are RS232, RS485, TCP / IP mode. Refers to a single controller connected to computer serial port through the RS232 serial communication protocol, achieve point to point management. Some people are also known RS232 as serial communication. 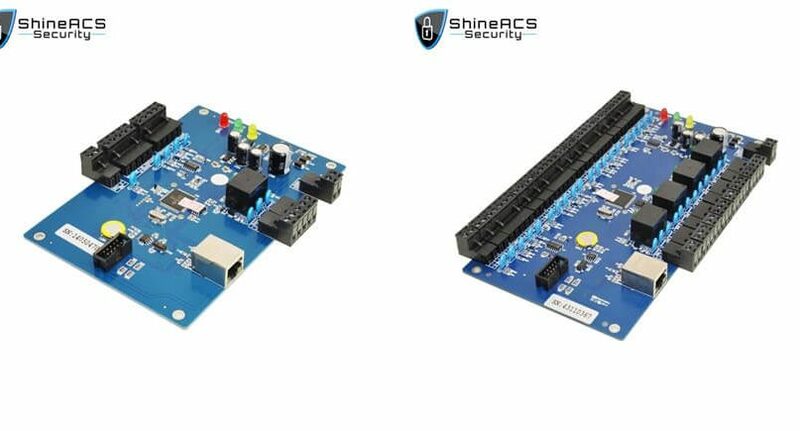 RS232 communication mode, the farthest communication distance is 13 meters (the distance within the communication stability), the recommended stability is within 3 meters, so standard serial communication line of a controller is 3 meters. If you need to extend, please extend the no.2 3 5 lines in 9 lines. Although 13 meters or above test seems to be able to communicate, but unstable, the anti-interference ability is poor, we do not recommend to do so. The general desktop computer has 1-2 serial ports (Com1 Com2), through the multi-serial board can be extended to up to 255 serial ports. The new notebook is generally no serial port, you need to buy USB-RS232 serial converter to achieve. The rs232 serial port can only achieve communication with ONE controller. RS232 communication mode transmission rate (commonly known as baud rate) is common for the 9600, the designing baud rate in the controller is 9600, the transmission speed is about ten times per second authority or record, on the market, there are some companies controller’s baud rate is 2400 4800 19200 38400. The higher the baud rate, the faster the transmission speed, but the shorter the transmission distance, the worse the anti-interference ability. Multiple controllers, through the RS485 communication bus (must be twisted pair, or one of the network cable), connect controllers with each other by hand in hand, a bus connected to the RS485 converter (hub), then connect to Computer serial port, to achieve a computer (software) on the management of multiple controllers and communications. The Farthest connection distance from controller to the computer, in theory, is 1200 meters, the proposed is in 800 meters, the best effect within 300 meters. If the distance is too long, you can purchase 485 repeaters (Extender) (Please buy from a professional converter manufacturer, where the repeater is placed in the middle of the bus or start, please refer to the manufacturer’s instructions.) The repeater can theoretically be extended to 3000 meters. That is, a 485 bus can take how many sets of controller, depending on the communication chip and 485 converter communication chip selection of the controller, generally have 32, 64, 128, 256 several options, this is the theory numbers, the actual application, according to the scene environment, communication distance and other factors, the number of loads can not reach the number of indicators. If there are hundreds of thousands of controllers, please use a multi-serial card or 485HUB to solve. Firmly prohibit the use of passive 485 converters, passive 485 converter cost is only a dozen dollars, although the nominal load number is 32, the actual application can not afford 5, the communication bus can not exceed 100 meters, no lightning anti-surge design. TCP / IP communication protocol is the current common standard protocol of computer network, with transmission speed fast, international standards, compatibility and etc features. In the small local area network, can be extended through the HUB cascade communication distance, each level’s communication distance is 100 meters, you can cascade multi-level. But also in a large local area network can be extended by fiber and other means to a lot of kilometers or even kilometers, and even across the city, can also reach thousands of kilometers through the Internet can be a network. There is no limit, in theory, HUB can be cascaded, thousands of sets of controller network are ok.
Communication speed, for example, TCP / IP product communication speed is ten times or even several times than RS485 RS232 controller. Upload permissions per second or download record more than 100, or even hundreds of. In addition to RS485, TCP / IP mainstream communication, there are very few companies also use LAN LONGWORK and another bus network, these methods used very little, there are advantages and disadvantages, compatibility between products is not good compatibility, technology is not Popular. Most of the RS485 access controllers have RS232 communication port but generally, need to the jumper or DIP switch to set which communication is used.Some brands of controllers integrated RS485 and TCP together, dual communication design, this design cost is relatively high, practicality is not strong. The cost is relatively low, separate networking, will not be affected by other equipment. The number of networking is limited, usually within 1000 units, the more equipment, the more complex the network, the greater the interference. The scope of the network is limited, generally only in the range of several hundred meters. Communication speed is relatively slow, for more than 10,000 people, hundreds of doors of the system, upload permissions, download records and another operating speed is relatively slow. International standards communication protocol, advanced and performance are better, will not be eliminated for many years. There is no limit to the number of networks, a wide range of networking, cross-regional, and even cross-border. Communication speed, suitable for over 10,000 people, over a hundred doors, access control system. Communication quality is stable, not susceptible to external interference. If the user already has a local area network and other networks can not re-lay the network, the use of existing network networking. The cost will be slightly higher than the RS485 controller.